Leo loves to grill. He is a master at grilling steaks, but he only uses a charcoal grill. Our trusty, black Weber grill had to be replaced a few weeks ago. So Leo bought another trusty, black Weber grill since the other one had lasted about 7 years. But I didn’t want a black planter. I thought we should paint it. So Leo bought some spray paint and painted it green. I had a few extra plants that needed planting. I put a begonia, some coleuses, basil, oregano, and chives that I grew from seed, and some Black-eyed Susan (Thunbergia alata) volunteers that were coming up along the fence from where I had planted them last year. Are you familiar with this vine? I have them growing on two trellises in planters in front of our house. Last year I had them growing along our garden fence. 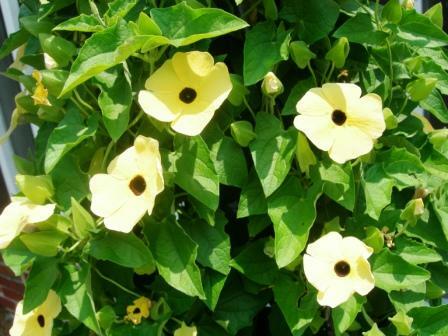 They are very easy to grow from seed. They love the sun and the heat. This picture was taken last year. So I was very happy to see all the volunteers that were growing along the fence this year. I put some in the grill planter and look at it now! See the Black-eyed Susans? They are beginning to spill out of the planter. In a few weeks, it will look like a waterfall of flowers. 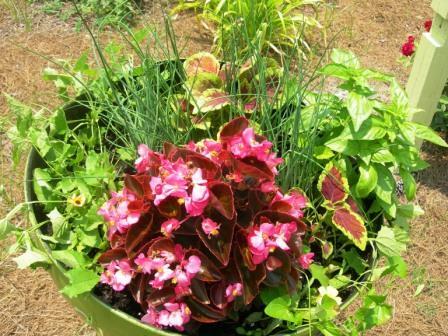 The planter is almost the same shade as our other two planters in this flower bed. I wonder what people think when they drive by our house and they see this grill planter. I’m thinking I really like it. what kind of paint did you use? did you use a gloss as well? Thanks! No, but you could use a gloss if you’d like to do so. This is awesome. I’m always looking for old, unused items to reuse. My daughter left her old barbeque in our yard and now I don’t have to walk around it wondering what to turn it into. Thanks for sharing! I LOVE, LOVE, LOVE this painted grill and your updates. Anything for outside is appealing. Thanks for sharing, one day I plan to have a “greener” thumb ???? OMG, so cute! I hope I can find one of these on someone’s junk pile this Spring. Love this idea! The color you chose is perfect! Hi Jane! I saw that this project was featured at Hometalk and I’m so glad because I missed it when you posted it on your blog. I’ve pinned it and posted it on FB. I’m having trouble keeping up with everything blog-related. I need a check list just to keep everything straight! Blog, Google+, Pinterest, FB, Hometalk, Linky Followers. Whew! Hope all is well with you and Leo. I’ll be by to visit again asap. This is such a terrific idea. I see these old grills all the time and they have such a great shape…not sure why I’ve never thought of this, but it’s wonderful! Thanks for sharing it! Jane. wow! 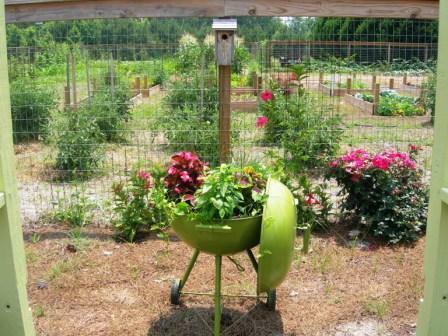 you have a green thumb that is really showing out in the green grill,love your color choice. Jane I love the grill planter!! Just adorable! What a CUTE idea! I love this too! 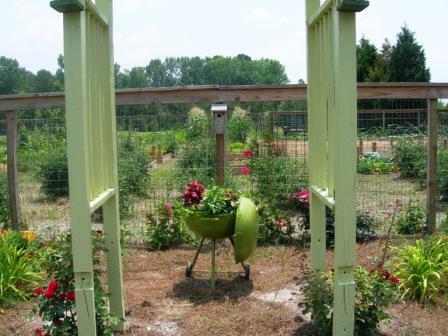 The green is perfect….love your garden too, WOW! What a great way to repurpose a grill. Love it. Thanks for joining WUW. Anything painted lime green is cuter! This is a great idea and who cares what the neighbors think! Jane, What a cute and clever idea! 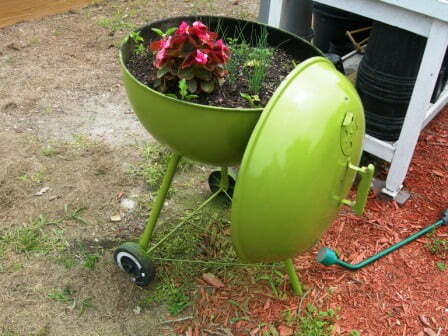 I love the paint color and the grill looks wonderful as a planter. Thanks for joining my party. I love your grill turned planter!! your garden is gorgeous. I love it, and love the green!!! “GRATE”: idea:):):), get it???? HAHAHA!!!!! What an absolutely DARLING idea Jane! Way to go on the creativity and repurposing. 🙂 Thanks so much for sharing this with us at Inspiration Friday this week! Oh my! I saw that in a magazine and never could find it again. Totally could not remember where I saw it. I love it! I am so glad I saw your post! 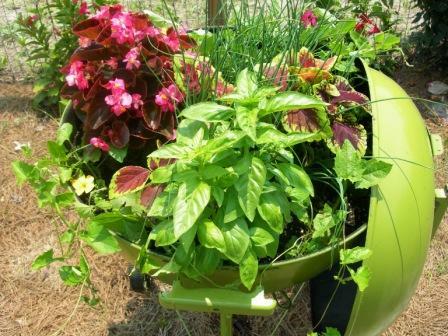 Your grill planter is beautiful! 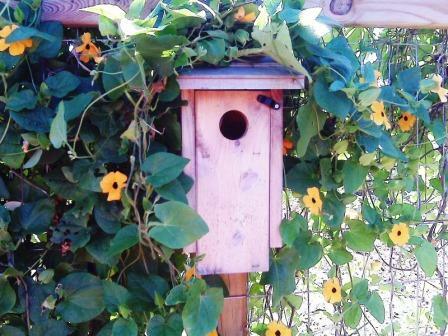 I love the plants you used, especially the Blackeyed Susans! How fabulous is your garden? So glad you shared! Jane, that is the cutest idea!!! Thanks so much for stopping by. . . you would LOVE Nova Scotia! I hope you get to come one day! Love this!! I have an old wheelbarrow that I use in the same way. That is brilliant! 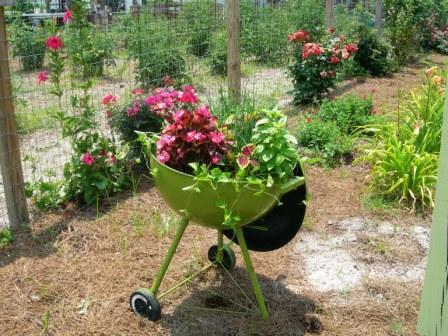 What a great way to liven up your garden in a unique way and keep that grill out of the landfill. Never mind the fact that it’s absolutely adorable! I’ve never seen that done! So adorable! Creative thinking. What a brilliant idea…I love it! How stinkin cute, and I love the lime green color you chose. My porch is decorated in lime green, and I may just have to have this idea. You are to smart. Thanks for the inspiration. hello! 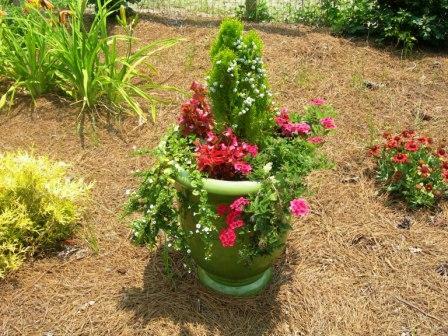 What a wonderful planter, im so glad you came over to my blog- because now i can join up with you! Thanks for your comment, my headband is actually an old Ken Done silk scarf that I got from an op shop for $2. I love it and wear it all the time! How stinkin cute! I love that idea! !